Referral and affiliate programs are a great way for marketers to make a little extra cash, and for businesses to attract more eyes to their product. Both programs bring new customers to your business through advocates of your product. At ShortStack, our referral program offers up 30% commission for each person who signs up for our service through a special referral link. And there are a lot of businesses out there that offer some great paybacks to their referrers. However, before you go in and try and make a boatload of cash by referring products, there are a few best practices you should keep in mind so that you’ll actually see success. There are a lot of great products out there that offer referral incentives, but you’re more likely to profit from referrals if you’re recommending products you’re passionate about. “I only recommend a product if I use and love it. And I use and love ShortStack. It’s made my life easier and has helped me creat Facebook Campaigns that look much better than anything I could have created (and have previously created) from scratch or another tool.” – Jon Loomer, top ShortStack referrer. The more often you use the products you’re planning to refer, the more materials and resources you’ll have at your disposal to share with your audience. It’s also a good idea to research what is required of you before you sign up for a referral program. Some businesses may require that you post a certain amount of times, run certain ads/banners, etc. At ShortStack our referral program is no pressure, and it’s completely up to you how often you do or don’t talk about the platform. Many of our users sign up for our referral program and then nothing ever happens. In order to reap the referrer rewards, sign up and grab your referrer URL stat! 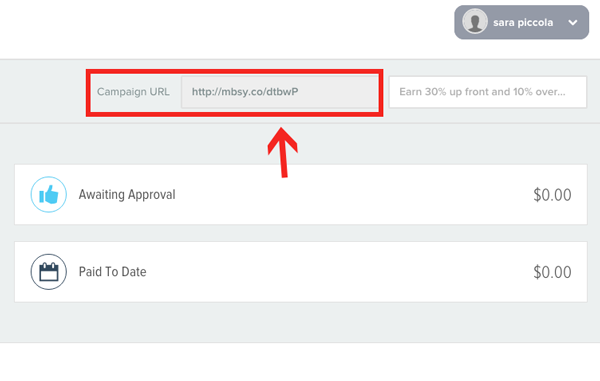 Here’s a step-by-step look at how to sign up for ShortStack’s referral program and finding your referrer URL. Step 1: Head to https://shortstack.getambassador.com/ and enter your First Name, Last Name and Email. Step 2: Find your URL in the upper right-hand corner of your dashboard. Step 3: Use your URL whenever you link to ShortStack. Step 4: Use logos on your blog and website to increase referrals. In your dashboard, ShortStack logos can be found under assets. Each logo has an embed code so you can easily place the logo on your site. While putting a logo on a service or tool you’re referring on your website will drive organic traffic, providing your audience with valuable resources will educate them in their industry and lead them to tools that can help them be better at their job. Consider your referrals as part of your content marketing. It’s best if you can avoid a hard-sell and instead subtly recommend the products and services that fit in with what you’re already writing about. For example, one of our top referrers is Jon Loomer, the Facebook Ad expert. Since Jon’s specialty is Facebook advertising, he’s constantly writing articles about how marketers can be better at Facebook. When he has a chance to mention that ShortStack can help in that process, he does, and it continually makes him our highest paid referrer. All it takes is one great article with SEO and you’ll be sending traffic to the service you’re referring for years to come. 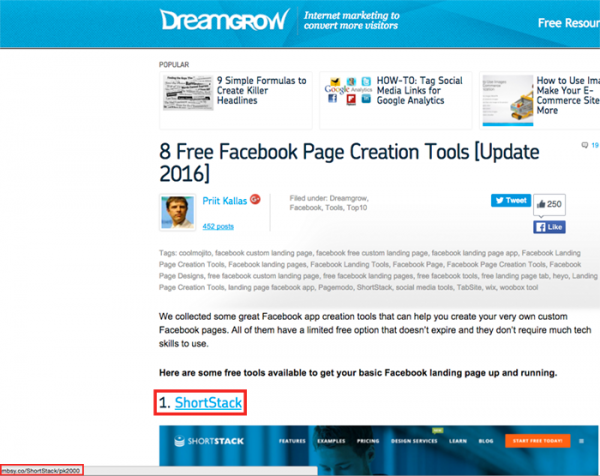 Here are a few great examples of marketers who are writing valuable content that include a ShortStack mention at the same time. All of these articles would have been written whether these people were ShortStack referrers or not, which is one thing that makes them so successful. Creating consistently valuable content can be difficult! On the ShortStack blog we’ve found a comfortable balance that includes original content, guest posts, and infographics from third parties. One of the best ways to find inspiration for your blog posts is to read the blogs of your favorite products. Why? the company’s blog is where you’ll find valuable resources that you can link to and share with your audience. While every brand would love their referrers to use and then review their products, it’s not always a realistic request. Instead, consider what you’re creating and using that product for, and share your experience with your audience. For example, if you’re an agency and you create a two-week giveaway, chances are the readers of your blog would love to see your process and hear about your results. One example of a ShortStack referrer who is great at sharing his experience is Christian K.
Here’s an example of an article Christian wrote about how to display Instagram photos on your Facebook Page using ShortStack. Not only is Christian educating his audience on the value of integrating Instagram and Facebook, but he also makes it easy for any of his readers to start doing this right away. Referral programs are a great way to make some “extra” cash. If you’re already talking about your favorite tools and products, see if the companies that offer a reward for recommending your friends. 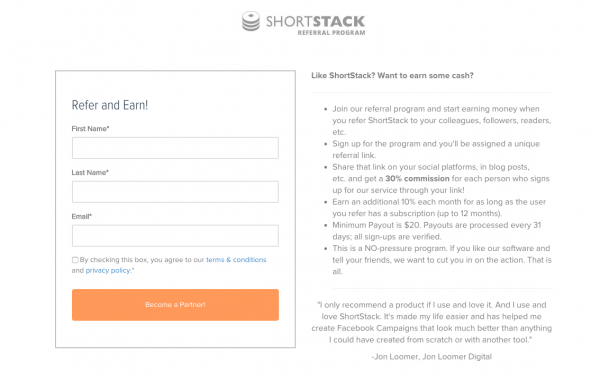 If you’ve been inspired to check out ShortStack’s Referral Program go ahead and sign up here. If you have further questions you can email brent@shortstacklab.com.